Baggage Series 4 alludes to the traumas that refugees carry with them—the toll it takes physically and mentally. 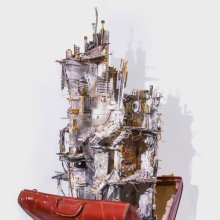 Each painstakingly detailed, multilayered model stretches skyward from suitcases that were themselves donated by the descendants of earlier generations of immigrants to the United States, who fled Europe and the devastation of the Second World War. My juxtaposition of contemporary art and historical artifact physically joins the stories of Syrian refugees to America’s long heritage as a nation of immigrants. 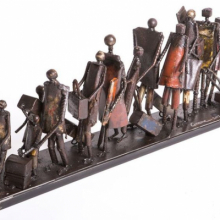 In its ability to connect with audiences at the level of their lineage, Baggage Series 4 transcends a purely humanitarian position and intervenes in the complicated racial and nationalist dimensions of refugee resettlement today. —M.H. 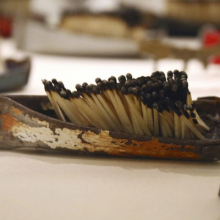 My Dark Water, Burning World is inspired by ancient Syrian sea vessels and deals with the way presentday Syrians escape while they carry visible and invisible scars scorched into them by separation from their homeland. They have not only lost their land, their possessions, their homes, and their people, but also, for many, their pride and identity. They have lost the tangible and the intangible, their pasts, presents, and most notably their futures. The sea is neither abundant nor beautifully mysterious for many Syrian refugees. It has turned into a terrifying passage through which their fates are being decided: to live or die. —I.K. I have always dreamed of peace, freedom, and happiness. However, in real life we are surrounded by hatred, injustice, and continuous deprivation of the most basic of human rights. When the civil war broke out in 1975 in Lebanon my family’s journey of survival started, fleeing from one place to another, seeking refuge first in France then the United States. My art revolves around my experiences through the various traumatic wars I witnessed not only in Lebanon but in the region since then. I immersed myself in a cathartic task by depicting the disasters I witnessed. After years of watching the war in Syria and the spread and horrors of ISIS through the media, I threw myself into reenacting the exodus of the thousands of people attempting to escape and find sanctuary elsewhere, to spare their families from imminent death. Sadly, many of them drowned or were lost at sea. These spectacles that the media was covering were something I had witnessed early in my life during the Lebanese civil war, but the Syrian refugee crisis is on a totally different scale. In my work, I use scrap metal to emphasize the degradation of civilization we currently live in. The use of rough metal conveys the misery of the people with their clothes and luggage. As an artist, I consider myself a witness of my time. My work documents the news by criticizing the violence manifested in the displacement of refugees and reflects an engagement, a manifesto against the war. —G.M.B. Syria, Then and Now: Stories from Refugees a Century Apart recounts the changing stories of refugees in Syria over time—then and now—and places their differing experiences, a century apart, in a global context. Around the turn of the twentieth century, Syria gave shelter to refugees from Russia—ethnic Circassians, displaced by the Russian conquest of the Caucasus. Today, a new generation of refugees seeks to escape Syria itself, after the regime of Bashar al-Assad used violence to put down pro-democracy protests and civil war broke out in 2011. 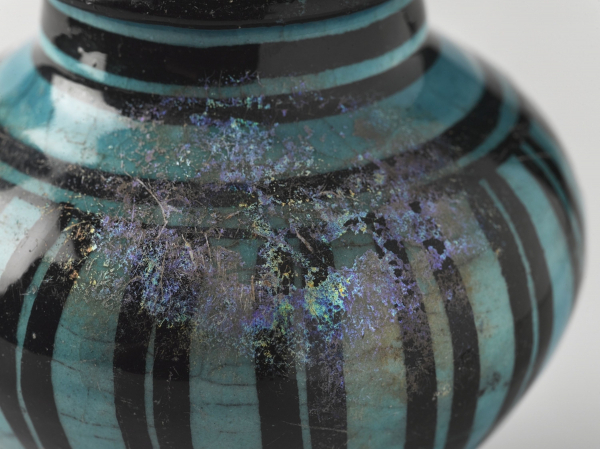 The exhibition presents thirteenth-century Ayyubid ceramics that were unearthed in Raqqa, Syria, by the Circassian refugees, who were searching for bricks to build homes. 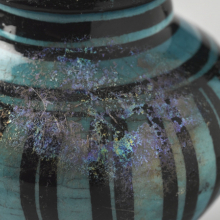 The ceramics are drawn from our collection and include vases, jugs, bowls, and oil lamps. The plight of current-day Syrian refugees is the focus of three contemporary artists whose work is also on view. Ginane Makki Bacho draws on her experience of civil war in Lebanon and the Syrian refugee crisis in the region. Issam Kourbaj engages the ordeal endured by Syrians attempting to escape by sea. Mohamad Hafez alludes to the traumas refugees carry with them, and the homes they left behind. Each of them tells a different story, but in the end each calls upon our common humanity for compassionate attention to refugees' precarious situation worldwide. Syria, Then and Now: Stories from Refugees a Century Apart is curated by Ayşin Yoltar-Yıldırım, Hagop Kevorkian Associate Curator of Islamic Art, Brooklyn Museum, as part of the Arab Art & Education Initiative.